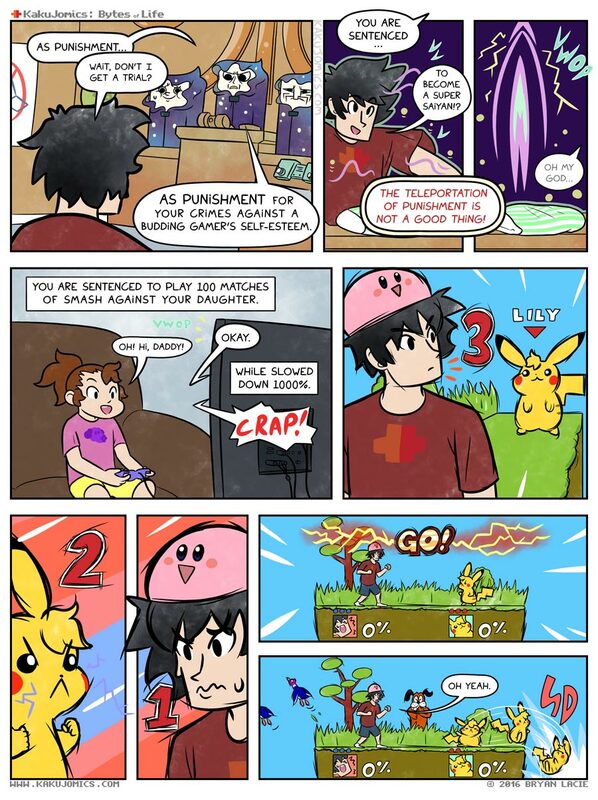 Man, that sketchy style in Smash Bros land extended the time it took to make this comic more than I expected. On the subject of the Ratchet and Clank remake, the gameplay is amazing. Hell, the entire thing has been really fun so far. This is coming from someone who never played any of the other entries (meant to, but had a severe lack of PS2), but it’s really got that early 2000’s feel that I never appreciated back then. Kind of like that show you used to watch because it was the only thing on and then years later made you go “Oh, NOW I get this!”. I’ve been streaming it Monday nights and I’m into it. ‘Prolly gonna put it up on YouTube with heavy edits once it’s all done. Not surprising the movie sucked, though. The fight wouldn’t be too different if this were a random FG player who lost five matches in a row and just banded his control stick to the left out of sheer anger. I like your Kirby hat. If this was a stream, it would be the smash lag stream, but with added Lily screaming, like in Duck Game. I mean, that’s still torture for Kakujo, but incredibly entertaining for us.